It is an enlightened person who takes the Teachings to heart and expressed them playfully as part of their realization. stand a good chance at making it through the Dissolution of the Ego intact. 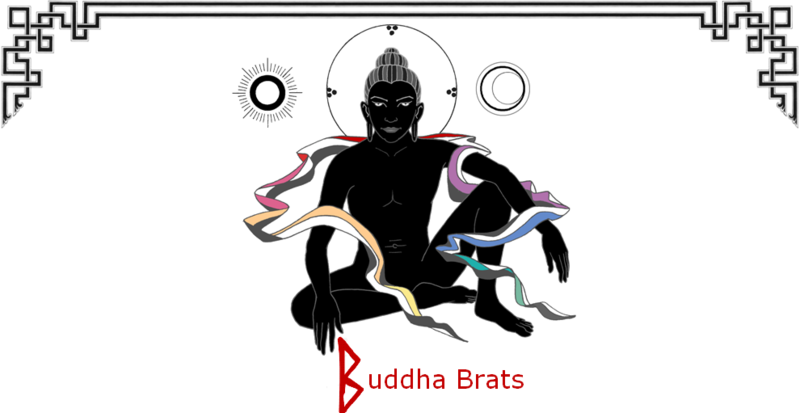 "Beyond Rebuke" is the Buddha Brats version of Vajra pride which in traditional Buddhism means complete confidence in ones own realization and subsequently all decisions that one makes. Contrary to common arrogance and yet without the need for false humility, one is in a state of Awareness that takes full responsibility for oneself and ones entire reality. With no one and nothing to blame, one can dance in and with reality without becoming trapped. The Natural state of Perfection is the unpolluted natural state of the mind or Buddha which is our true nature and present at all times. It is often described as unborn, undying, unobstructed, indestructible and undefiled - in essence, perfect and pure. According to Dzogchen all beings have always had 'Buddha nature' and this truth has never changed, and never will. It proposes that suffering is caused by the wrong perception that Buddhahood is something outside or separate from ourselves that needs to be attained. The Buddha is sitting down, symbolic of relaxation. The right hand touches the ground to signify confidence in realization. The left leg is propped up, ready to help humanity while the relaxed position of the left arm indicates that this commitment to compassion comes effortlessly. The body is black to indicate freedom from ego, in essence - empty like the night sky. It is naked and unadorned to indicate that this state of egolessness is not something to be acquired but rather the natural, primordial state inherent in all beings. This Buddha is sexless to encourage both men and woman to identify with these aspects in themselves. The sun and moon hover in imperceptible space to indicate that this Buddha is neither bound by time, nor trapped in any particular place. The sun and moon also represent the importance of using the feminine aspect of intuitive wisdom and masculine aspect of skillful means. Furthermore, the aspect of day and night can also be understood as conventional “right-hand” practices and unconventional “left-hand” practices. Behind the head is a melong (mirror) which is traditionally used to demonstrate the nature of the mind to students, thereby paying homage to the Dzogchen lineages. We also specifically refer to the Dzogchen teachings themselves which state that Buddha is always our true nature, we simply need to recognize it “like seeing ones own face when looking in a mirror”. The floating rainbow cloth points to the infinite potentiality of the manifest universe that is born from empty being. It is a symbolic reference that all thoughts, emotions and physical phenomena are in truth simply coloured light, movements of form. The ‘B’ in our logo comes from the symbol for “birch” in the ancient Futhark, the oldest form of runic alphabet. It traditionally stands for growth and prosperity. Norse mythology states that Odin hung himself from the world tree, impaled on his own spear in order to gain knowledge of the runes. This vividly demonstrates in western terms the Buddhist ideal of sacrificing the ‘self’. The word “rune” itself actually means “mystery, secret or whisper” thus aligning perfectly with Dzogchen as a teaching which itself was known as the “whispered teaching”. By choosing this rune we also pay homage to the forgotten lineage of the druids (warrior priests of the ancient west) for whom the birch was holy. Intentionally resurrecting our ancient roots, we symbolically demonstrate our uniquely inclusive strategy of fusing eastern wisdom with the fierce power of the west. This is a symbol with many permutations in various cultures and throughout time. It is one of the 8 traditional ‘auspicious symbols’ of Buddhism. Here it specifically denotes the interdependence of all things, the interconnectedness of all seeming appearances of duality as well as the indestructible, timeless and boundless qualities of ultimate, all pervasive and compassionate wisdom - Buddhahood. This mantra invokes the power of Ekajati, prime guardian of Dzogchen. Depicted as having one eye, one tooth and one breast to signify her unwavering commitment to Non-Duality, she dances on the corpse of a perverter of the Teachings. In this way all information on this site is magically sealed with secrecy from those who would slander or abuse it. There is nothing but the spontaneity of pure potential. There is no other way to dance in the sky. like space dissolving into space or like clouds dissipating in the sky. is not a place which you must reach. there is no need to cultivate it. so settle this issue by realizing it. Mind? Let it be as if it were the sky. Unobstructed experience is the greatest of all paths. my special take on the syntax. that people have to succumb to the sheer beauty of it.